-Reception: 7:30pm, 3512 Haven Hall. Food will be served. The Latina/o Studies Program, the Department of American Culture, the Center for Educational Outreach and La Casa invite you to celebrate Chicano labor leader César Chávez’s enduring legacy and the richness of Latinx culture at the University of Michigan. Please join us for a very special arts workshop with visiting artists Jeff Abbey Maldonado and Dulce Santoyo, to be followed by an artist talk featuring Jeff Maldonado and including a Flor y Canto Nahuat Xochitl in Cuitcatl Flower and Song Celebration with local and student poets. Our evening will culminate with a reception in 3512 Haven Hall to celebrate the University Housing donation of Maldonado’s 1998 César Chávez mural to Latina/o Studies and American Culture. Jeff Abbey Maldonado lives and works in Pilsen, Chicago. He has maintained his studio for the past 20 years. He studied under Mario Castillo, professor at Columbia College, who is credited with painting the first Latino mural in Chicago. Maldonado’s work has been shown nationally and internationally, including at the National Museum of Mexican Art, Chicago Cultural Center, The Field Museum, and the Chicago History Museum. Currently, he is Founder and Director of the J-Def Peace Project, which promotes youth empowerment through the arts. Dulce Santoyo is an emerging Latina artist working in Chicago. The Chávez mural was donated to American Culture in summer 2018 thanks to the student activism of La Casa. It previously was held by University Housing—a unit of Student Life—and was displayed in the César Chávez Lounge at the Mosher-Jordan “Mo-Jo” Student Residence Hall in the Hill Neighborhood on Observatory, home to the Michigan Research Community and the Women in Science and Engineering Residence Program. 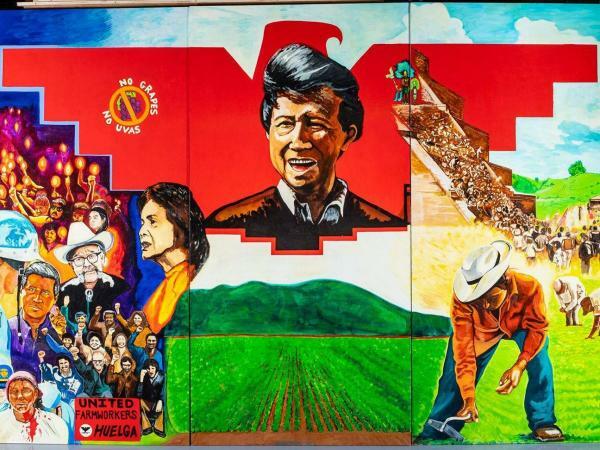 The mural is an interpretation of the activism of César Chávez, born of Mexican heritage in Yuma, Arizona in 1927. Chávez founded and led the National Farm Worker's Association (NFWA), the first successful farm workers union, later known as United Farm Workers (UFW).